The best fish recipe EVER! Cooking fish is intimidating for many people. Fret no more, fish steamed in a bamboo steamer is easy, healthful and extraordinarily delicious. 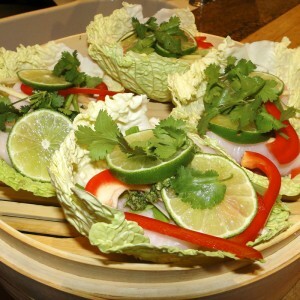 You can learn more about bamboo basket steamers here. Note: SNFD is an Amazon affiliate and we may make a small commission when you purchase through our links. My husband loves this method not only because it tastes so good, but because there are so few dishes to clean up. You cook your fish and your vegetables all at the same time, in the same steamer. You can cook whole fish or fillets in the steamer. I love cooking whole fish as the presentation is gorgeous and the flavor is enhanced by cooking bone-in. My husband prefers the fillets because they are simple to serve and eat. I personally like the social interaction that results from placing a whole fish between four people, giving them all a set of chopsticks and letting everyone have at it. If you are cooking whole fish, ask your fish monger to clean and gut the fish for you. Lay the fish on its side and slice crosshatched diagonal scores about 1" apart in the flesh of the fish. Do this on both sides. These cross hatches will enable you to season deep into the fish. 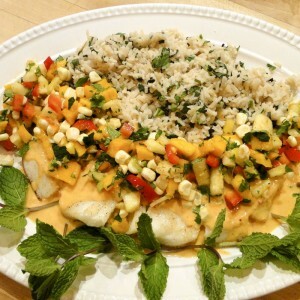 The sauce is what makes this particular fish recipe exceptional. The lemongrass-cilantro-lime-fish-sauce combination is mouth-watering. The best place to buy full stalks of lemon grass is at an Asian market or farmer's market. Many grocery stores carry only 3-4 inches of the lemongrass stalk. Optional additions to the sauce include: grated ginger, soy sauce, sesame seed oil and sriracha sauce. Modify to your palette. This recipe calls for black cod, also known as butterfish or sable fish. While I highly recommend black cod for its buttery deliciousness and high omega-3 content, you can use any fish for this recipe. Try salmon, mahimahi or halibut. 1 lower stalk lemon grass, outer leaf removed and cut into 1/2" slices. Pulse garlic and lemon grass in food processor using the chopping blade until finely chopped. Add cilantro and chili and pulse until finely chopped. Add remaining ingredients and pulse to incorporate. 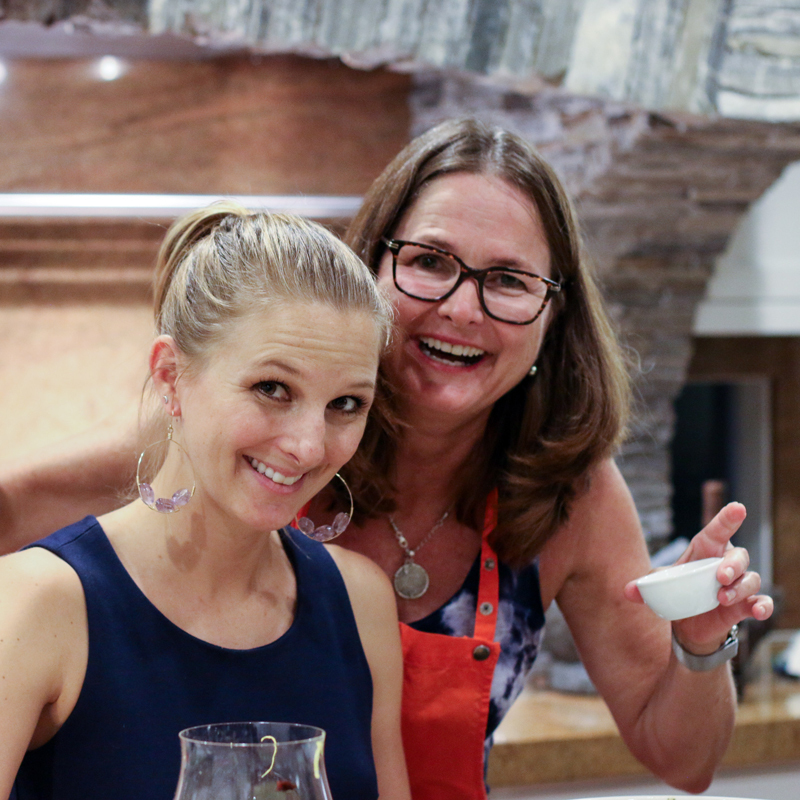 Taste and adjust flavorings. 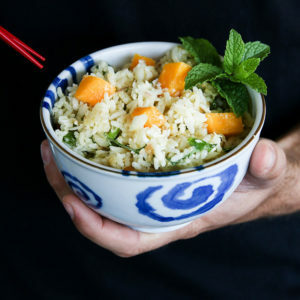 You can add a splash of soy sauce, sesame seed oil, sriracha sauce or grated ginger, according to your palate. Set aside. Pour three or four inches of water into the wok or pot. Make sure the bamboo steamer can sit on top of the wok or pot with some airspace between the water and the bottom level of the steamer. You want the fish to steam and not boil. Turn heat to high and bring to a boil. Season whole fish or filets. For whole fish, work salt, pepper and seasoning into the diagonal cuts on both sides of the fish. Line one of the bamboo steamer layers with the cabbage leaves. If you are making fillets, use one large leaf per fillet and place fish skin-side down. 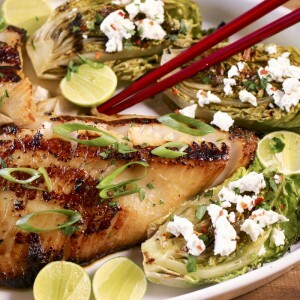 If you are making a whole fish, overlap the cabbage leaves to cover the entire bottom of the steamer. Drizzle one third of the sauce over the fish. For fillets, sprinkle the julienned vegetables over the fish. For a whole fish, stuff the diagonal crosshatches of the fish with the julienned ginger and sprinkle the remaining vegetables on top. Place limes on top of the vegetables and sprinkle with cilantro sprigs. Place the bamboo basket with the fish on the top of the wok or pot filled with boiling water. Arrange the vegetables, one layer deep in the second basket. Place the second basket on top of the basket containing the fish. Cover with bamboo top. Cook time will depend on the thickness of the fish, with a whole fish taking a little longer. A 1" thick fillet will take about 10 minutes. Do not over cook or the fish will be mushy. I recommend checking after 10 minutes and then every couple minutes after that if the fish needs more time. Fish is done when it flakes easily and is no longer translucent. The fish will continue to cook after you remove it from the heat. The vegetables will take no more than 10 minutes, so you may need to remove them from the steamer earlier if the fish requires more time. Check for doneness after 5 minutes. For fillets, you can serve the fillet on its cabbage bed. For a whole fish you can either remove the fish from the basket and place on a serving plate, or put the entire basket on a platter and serve from the basket. Drizzle fish with sauce and pass any remaining sauce at the table. You are my Yoda! I made the walnut salad with the steamed cod for a dinner party and it was a huge success! Thanks girl friend, you are the best. I’m so glad it worked out! What is great about both dishes is they are sooo easy! i’ve already made this recipe twice. it’s light, flavorful and the presentation is awesome!